I was doing some home plumbing and I wanted to add a new shower into my unfinished basement. 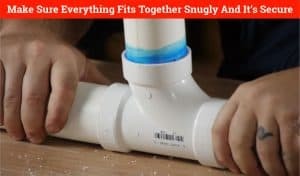 I wanted to do this as simply as possible and wanted to find out how to tie into existing plumbing quickly and cheaply. To tie into existing plumbing add a “T” joint. Line up the new “T” joint against the existing pipe and mark the section to be cut out. Take your Sawzall and cut through the existing pipe, making room for the “T” joint. 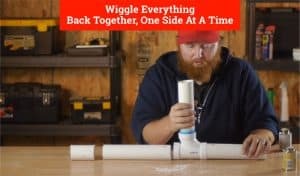 Line the new joint with primer and glue, then join the pipes together. Tying into existing plumbing does not have to be hard, and in this article, we will show you step by step how to do it the correct way to avoid leaks, save you time and money. So let’s show you exactly how to tie into your existing plumbing…. It’s really simple to use an existing line to add some plumbing to another part of your home. This is a common method used to add a sink, toilet, and even a shower to an unfinished or renovated part of your home. There are seven simple steps to follow to be sure you successfully complete the job. Before we get started there are some basic tools that you’ll need for this job. You’ll need a good Sawzall, pipe glue & pipe primer, and a marker. You’ll also need the “T” joint that you will add to the existing pipes. Also, a good utility knife will help you deburr in inside of the PVC pipe. And, if you are going to be cutting open your walls to repair pipes, I would really consider a good air filter for your home. Take your “T” joint and place it next to your existing pipes. 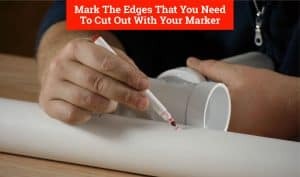 It would be helpful to mark the whole section that you need to remove with an “X” I like to use a red marker – it’s easier to see. Pro-Tip: these directions will work on a pipe that has “ play” – meaning enough room to move back and forth slightly. You need this play so that you can slip the pipe into the “T” joint. If your pipe does not have any movement – don’t worry. I’ll have some tips down below to make your job easy. Cut the pipe along the lines you marked earlier. You’ll want to secure the pipe as much as possible to keep the vibrations from cutting the pipe to a minimum. You do not want to damage the pipe down the line in another section. 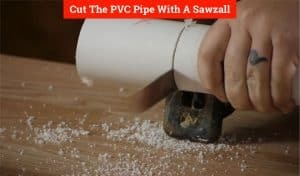 You can easily cut the PVC pipe with a Sawzall. Once you’ve cut the pipe – join your “T” sections to the main line and dry fit everything together. You want to make sure everything fits together snugly and it’s secure. 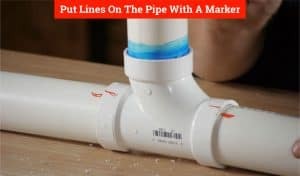 Once you’re happy with the fit, take your marker and put lines on the pipe (You’ll be able to align the pipes easier when you reassemble everything after you apply glue). 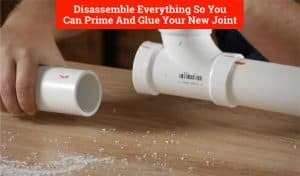 Disassemble everything so you can prime and glue your new joint and start to assemble everything permanently. 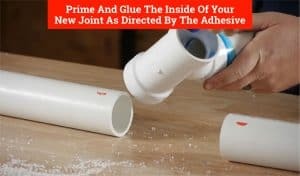 Prime and glue the inside of your new joint as directed by the adhesive. Once everything is in place, lined up and securely assembled – hold the pipes in place as they will want to slip apart. 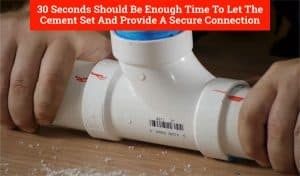 30 seconds should be enough time to let the cement set and provide a secure connection. And that’s it! You’ve just tied a line into existing plumbing. Don’t forget to keep the line dry for 24 hours – so no water through those pipes just yet! In case you are replacing a pipe that leaked, you may need to clean up and kill any mold that may have formed, here is a good product you can read about. Q: What if I have two different size pipes I want to join? Would I need a special tool or part? A: Great question! As long as there is play in the line this method will still work for you. You will need one additional special part, and that’s called a reducing bushing. Keep in mind that pipes from the main supply can be up to 20 inches and length, and the pipe your faucet uses is only a half inch. Keep in mind that if there is a large size that needs to be reduced, it must be done in stages. Here is a helpful link with more information and resources here. Q: Does this method work if my pipe does not have any play? Q: What can I do if I have different types of pipe – like metal and PVC – can I still join them? A: Of course you can join pipes that are of different material types! You’ll need special couplings to do the job, and it will depend on the types of pipe that you want to join together. Here is a good resource (with a diagram!) that will show you some typical connections. Also, keep in mind that you may have specific requirements in your area when it comes to building codes, so keep that in mind! In this article, we showed you how to tie into existing plumbing in seven easy steps. Plumbing does not have to be intimidating if you break it down into simple steps – anyone can master simple repairs and additions in no time flat!